I love Indian pictures and this is very good.. Very good! The colors are beautiful, and you captured a very thoughtful expression. Great chiseled features, Good work.!! 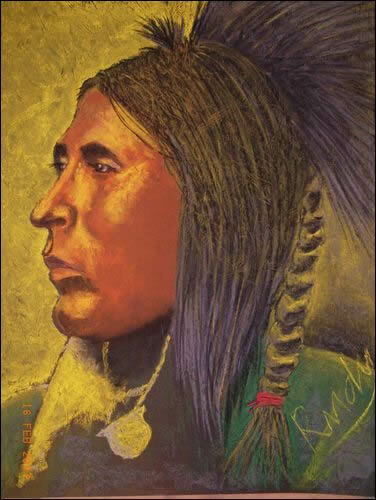 Your use of color and portrayal of this Native American is EXCELLENT! The expression you have captured in his face is done quite nicely! The light yellow shapes around his neck seem to detract a bit from the lovely work you did on his face. Maybe this is because they are so light and “hard edged” against that dark background and therefore draw our attention to them! By pushing the value back, a bit darker and softening the edges, the importance of these shapes would be less. The braid behind his head seems to be “not part of his head”. Maybe softening this shape and losing it into the background would help, especially up near the top of the head. One lesson I always learned from my life drawing classes was to give MORE ROOM on your paper in the direction that the model is facing. By this I mean that by placing the face farther to the right of the paper would give more room to the left of your painting and it would not look crowded so close to the left side. You have captured the proud spirit of this Native American and it truly shows in your work! CONGRATULATIONS! The other little things are just minor things, but the most important thing….the communication….you did very well! Thank you for sharing your work with us! Keep practicing and keep painting! Hi Jade – I think you portrayed the pride and yet the sadness really so well. I don’t know a lot about the American Indian – only what I have watched in films (I live in New Zealand) but I felt so sad looking at this proud man and what his people have lost. I really think you have captured the feel. nicely defined cheekbones and great eyes! Lovely work, love the facial expression and colours. I like the many colors in this painting and how they all work together. I am now practicing on portraits and the subtle tones of skin are fascinating , and hard to achieve. You have done quite well with that. Thanks for contributing. I think it is very well done. Faces are so hard to do.